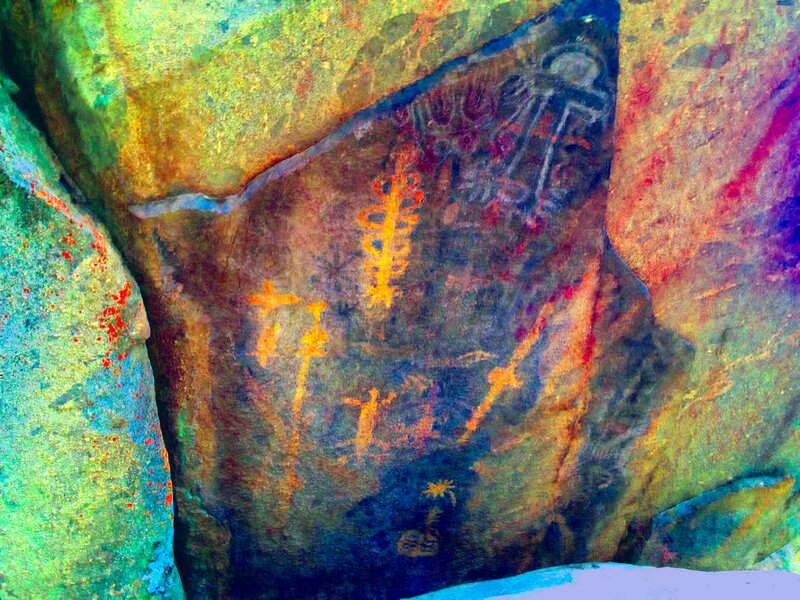 Pictograph Sites in and near Sequoia and Kings Canyon National Park. 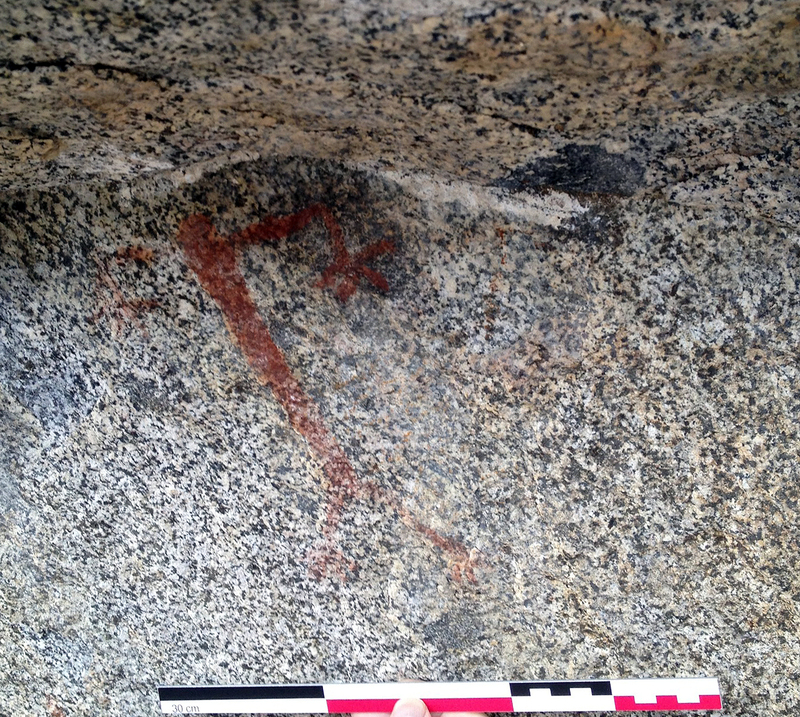 Several pictograph sites are found in and around the area of Sequoia and Kings Canyon National Park. 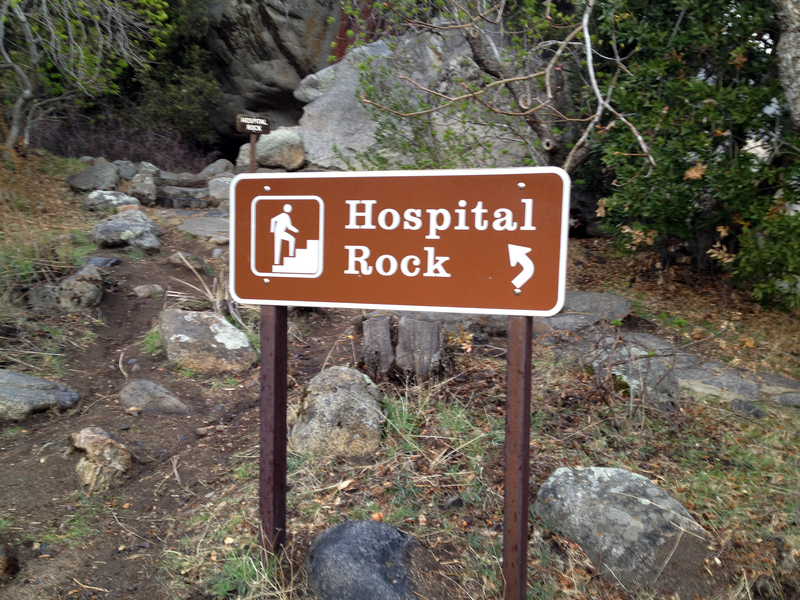 The most accessible site is Hospital Rock situated on the Middle Fork of the Kaweah River. 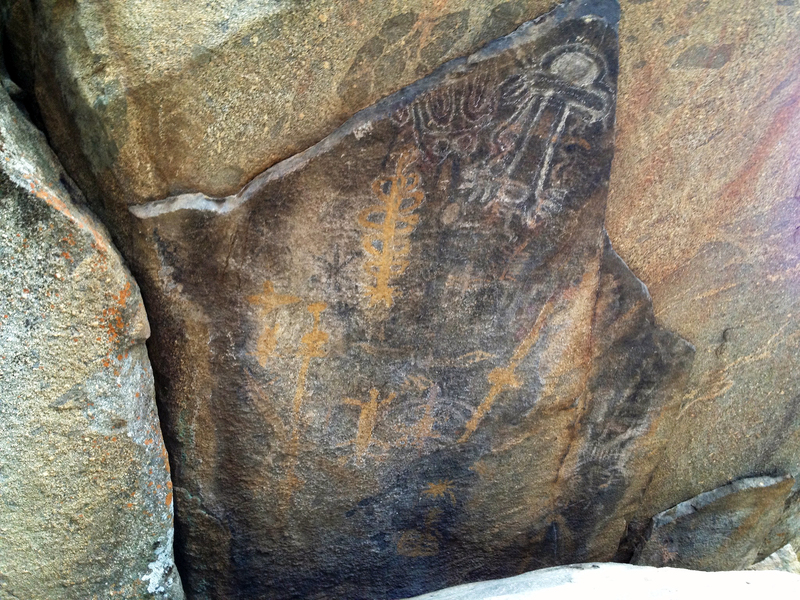 View of the largest panel at Hospital Rock. DStretch image of largest panel at Hospital Rock. 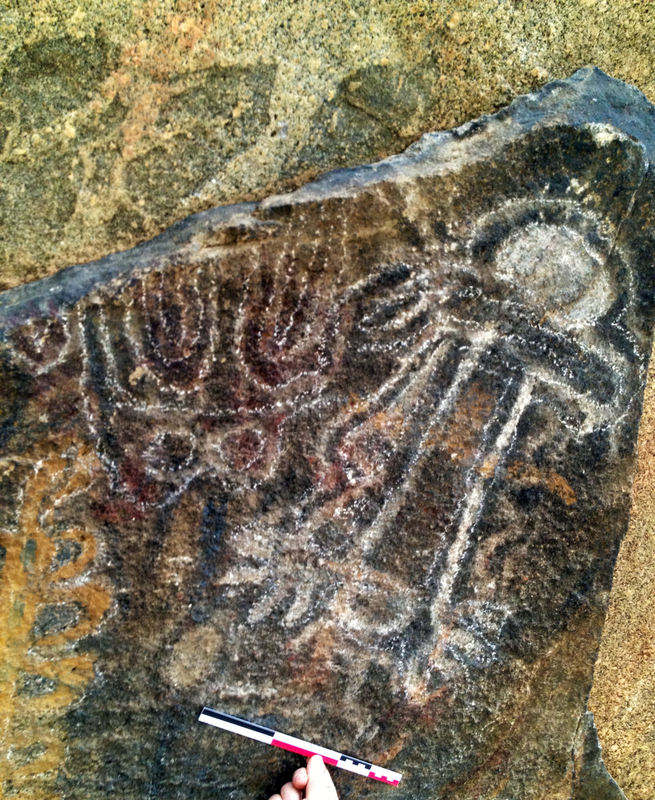 The DStretch plugin to the ImageJ program was written by Jon Harman for rock art researchers who wish to enhance images of pictographs. 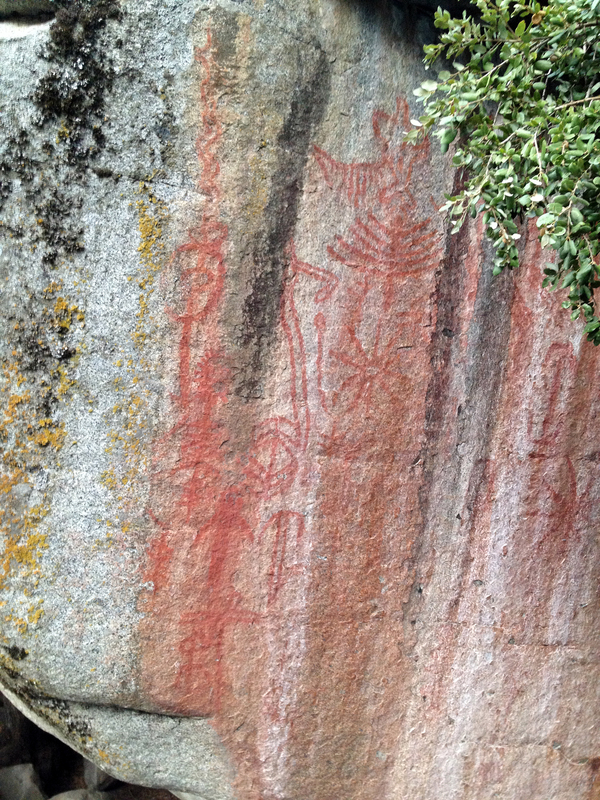 Closeup of the panel at Hospital Rock. 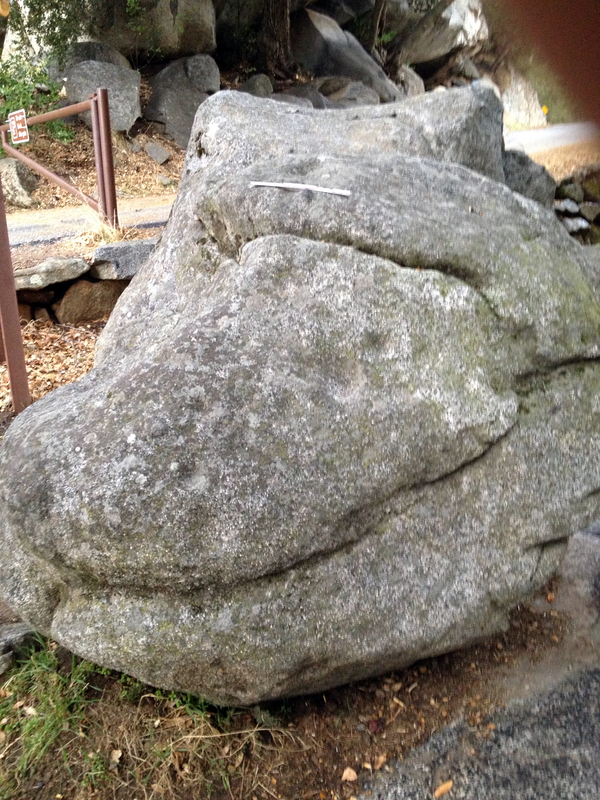 Boulder situated near Hospital Rock; the boulder is decorated with dozen of cupules (manmade conical depressions). 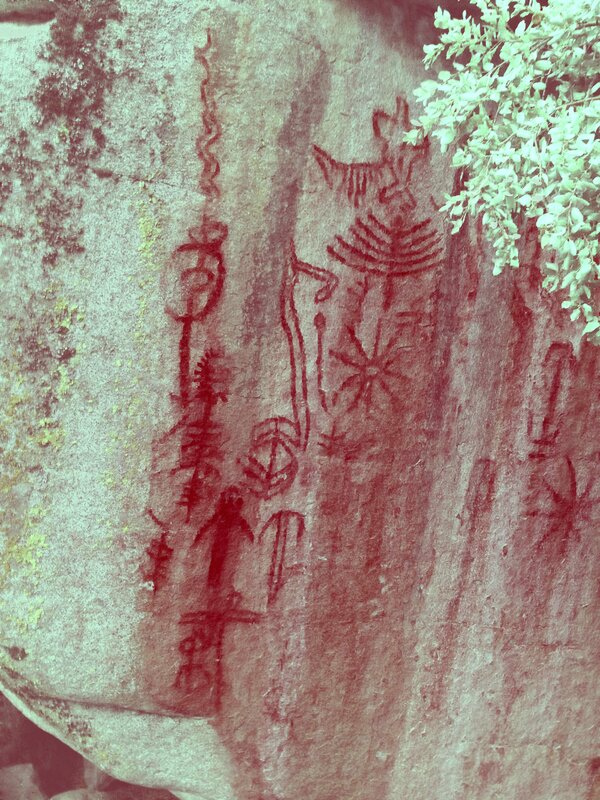 There are pictograph sites situated at higher elevations than Hospital Rock. 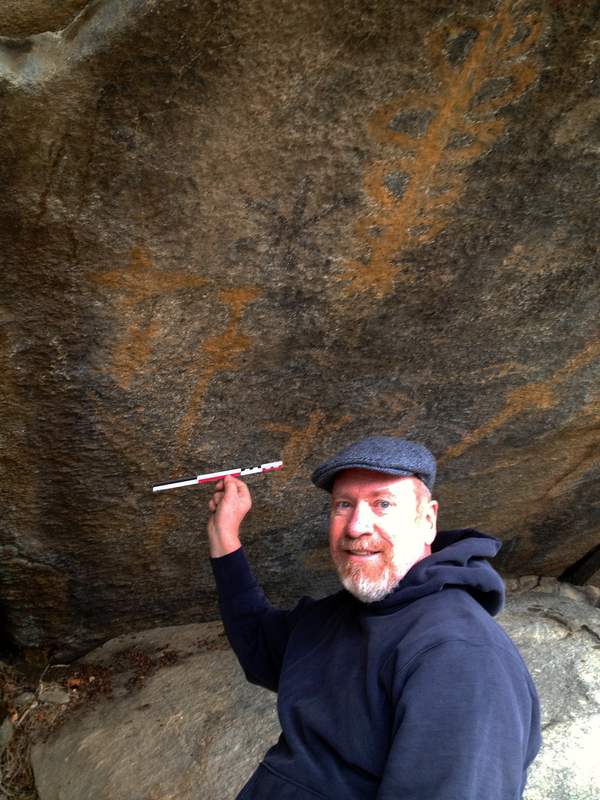 John Pryor (Professor Archaeology/Sociocultural Anthropology at California State University in Fresno) examines pictographs on a granite exposure in high elevation. Scale is 30 cm. 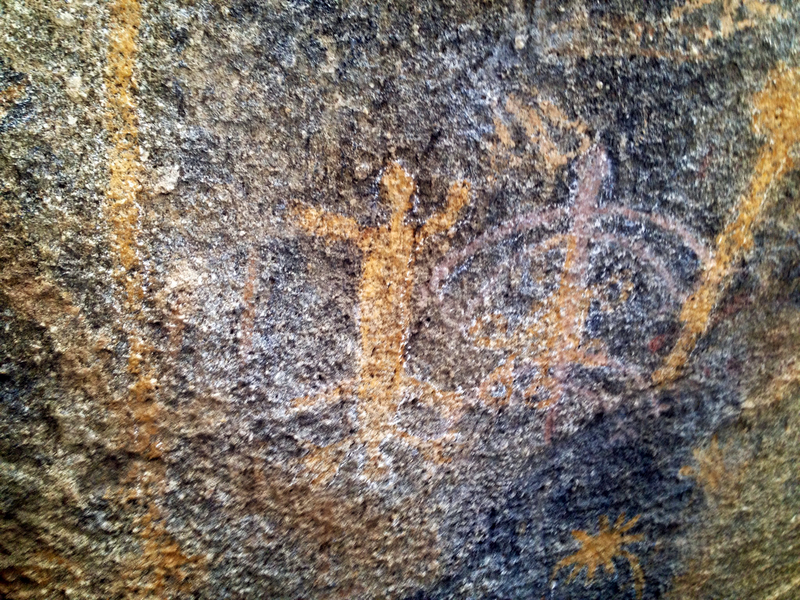 Detail of a pictograph. Scale is 30 cm. 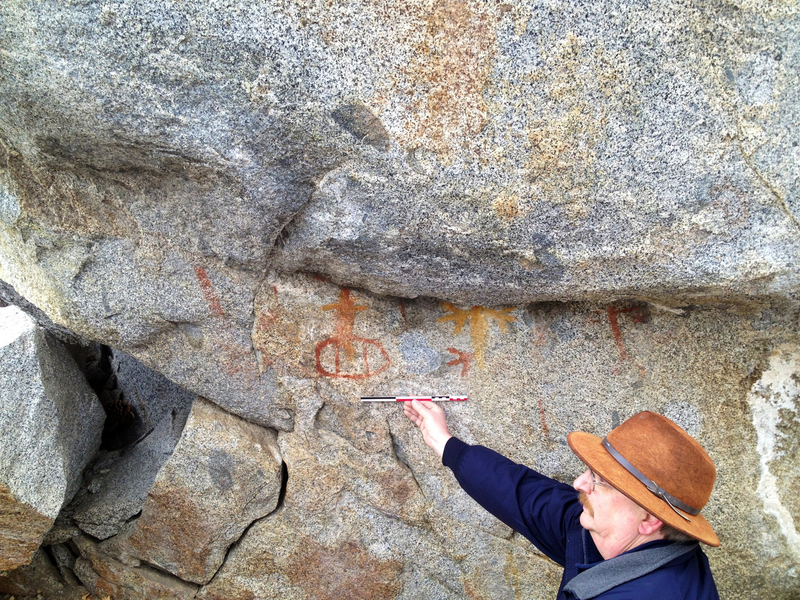 Professor John Pryor (CSU - Fresno) points out two anthropomorphic pictographs in a shallow overhang. 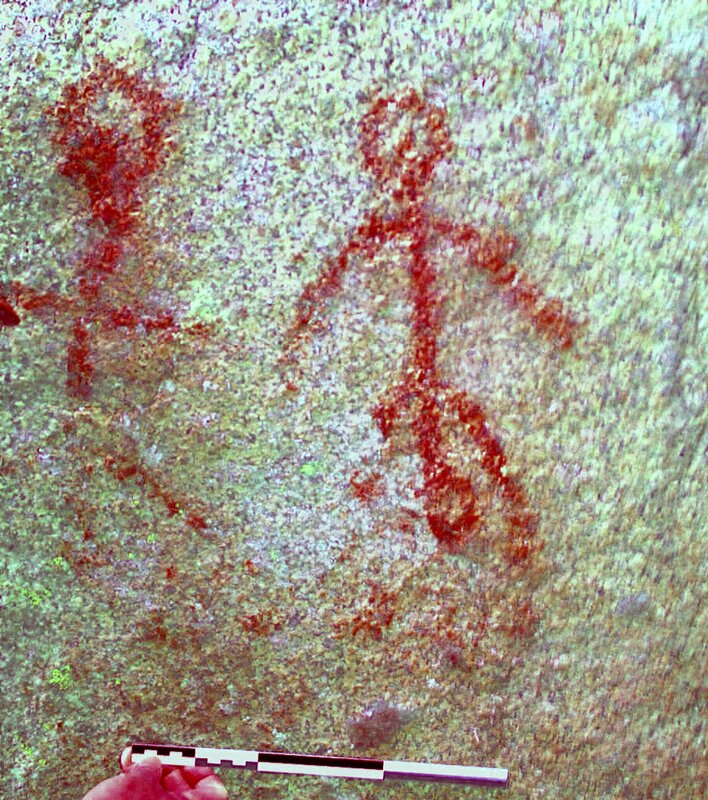 Two anthropomorphic pictographs in a shallow overhang. 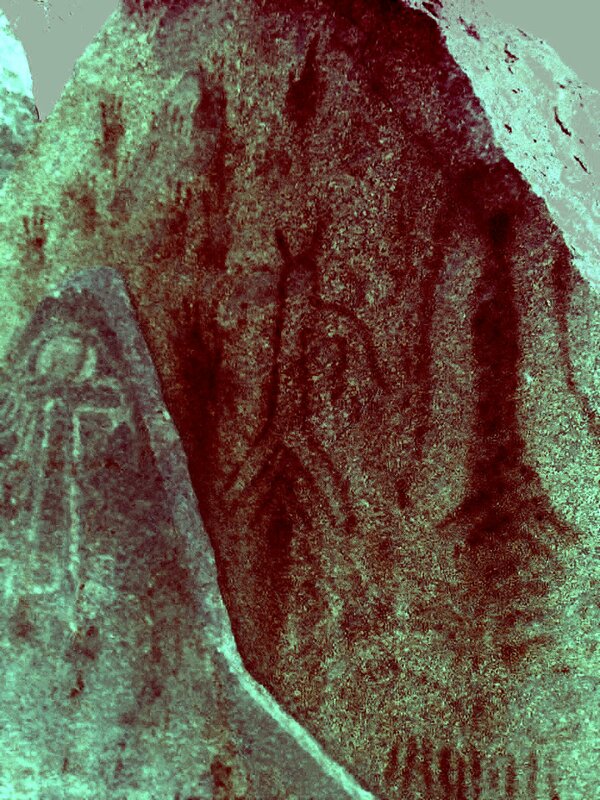 DStretch image of the two anthropomorphic pictographs in a shallow overhang. Scale is 30 cm. 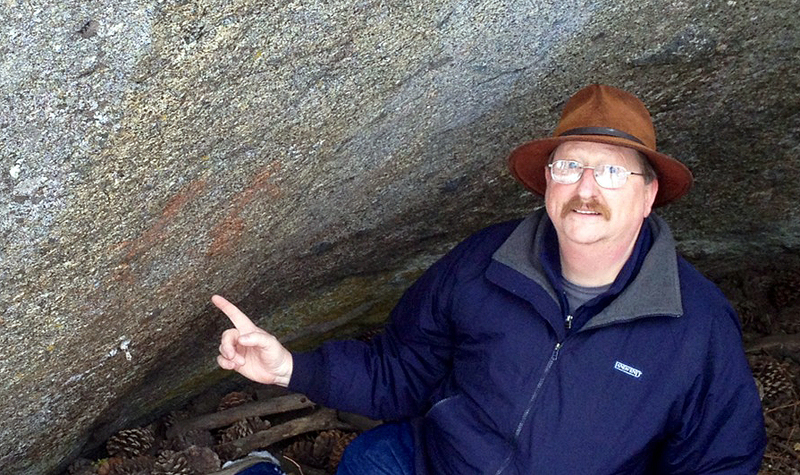 John Pryor (CSU - Fresno) waves from a shallow rockshelter with pictogaphs on the ceiling. 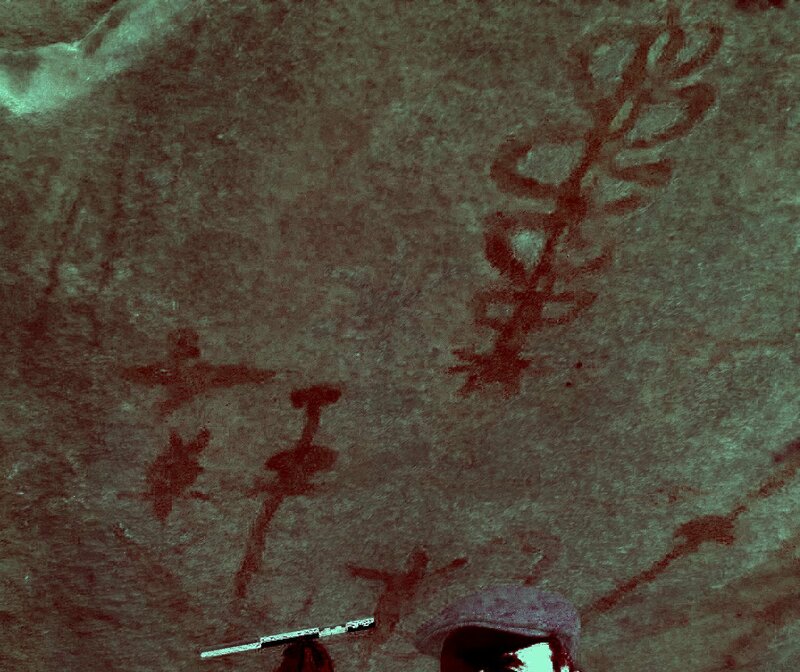 Pictographs on the ceiling of a shallow rockshelter. 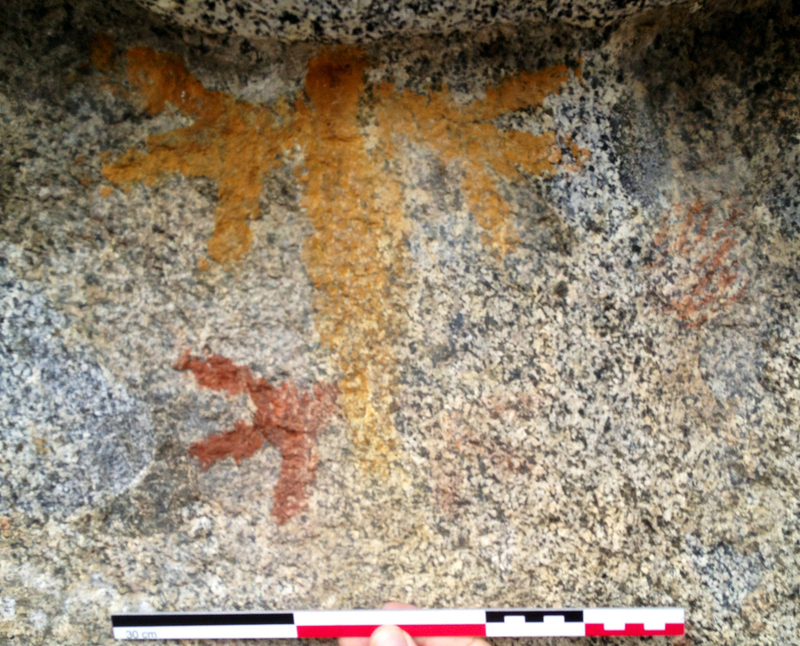 DStretch image of the central panel inside of a shallow rockshelter. 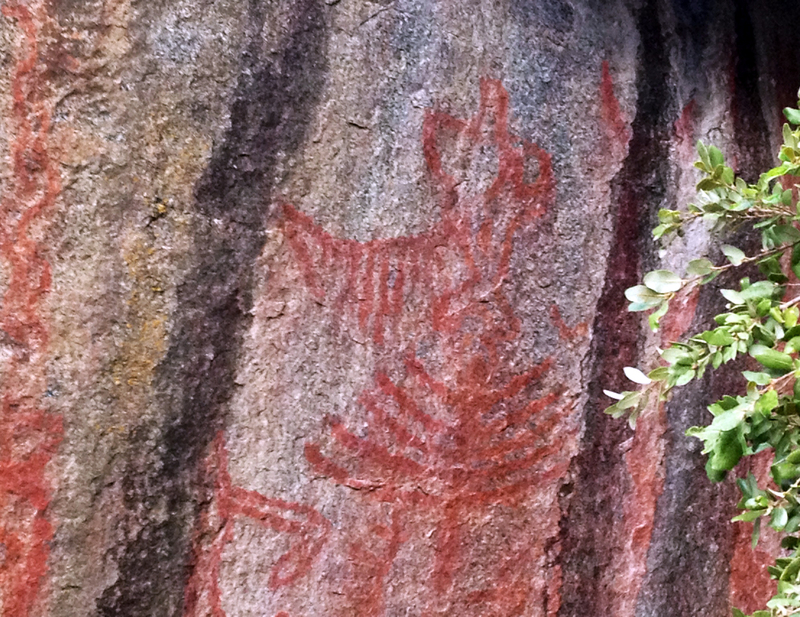 The DStretch plugin to the ImageJ program was written by Jon Harman for rock art researchers who wish to enhance images of pictographs. 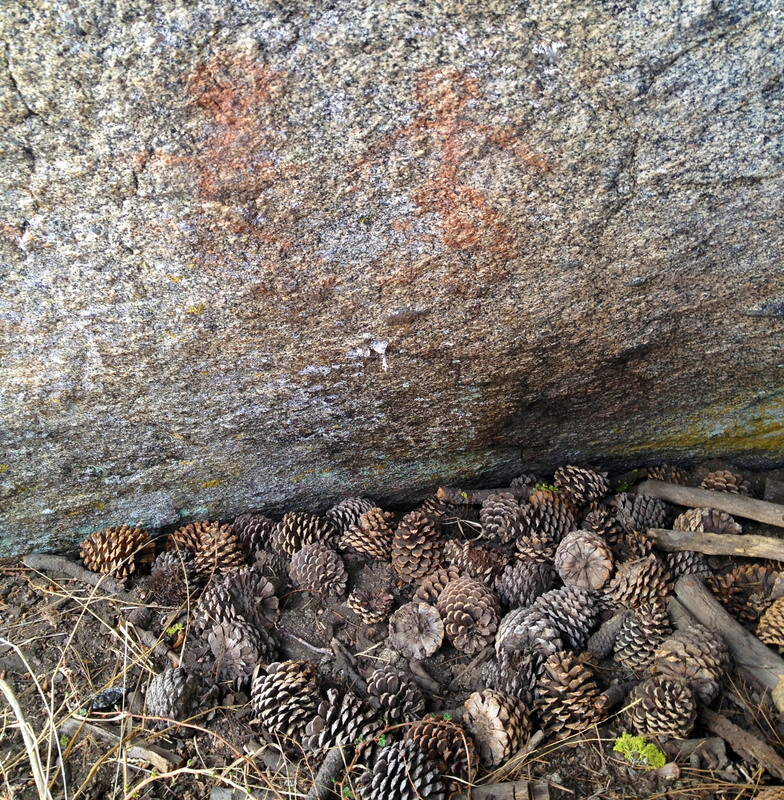 DStretch image of the upper panel with handprints inside of a shallow rockshelter. 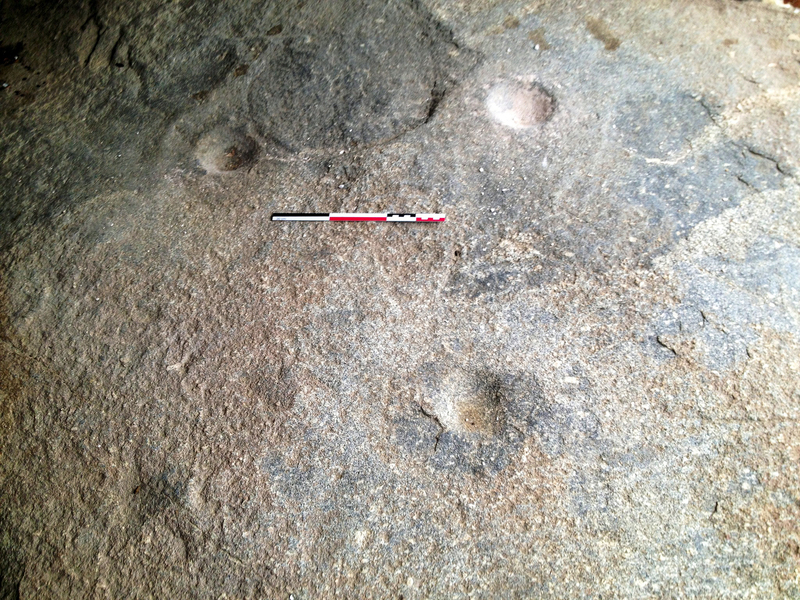 Cupules on the floor of a shallow rockshelter that has pictographs on its ceiling. Scale is 30 cm. 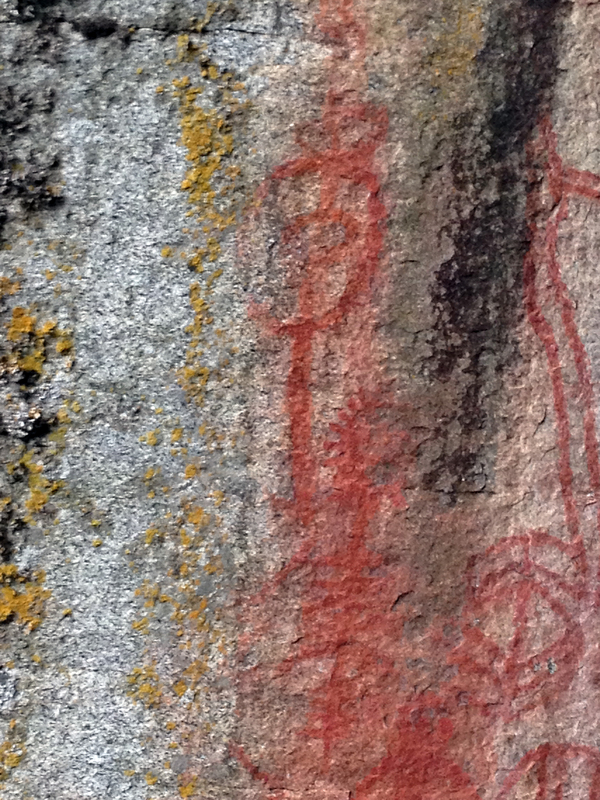 Pictographs on the ceiling of a shallow rockshelter; scale is 30 cm. 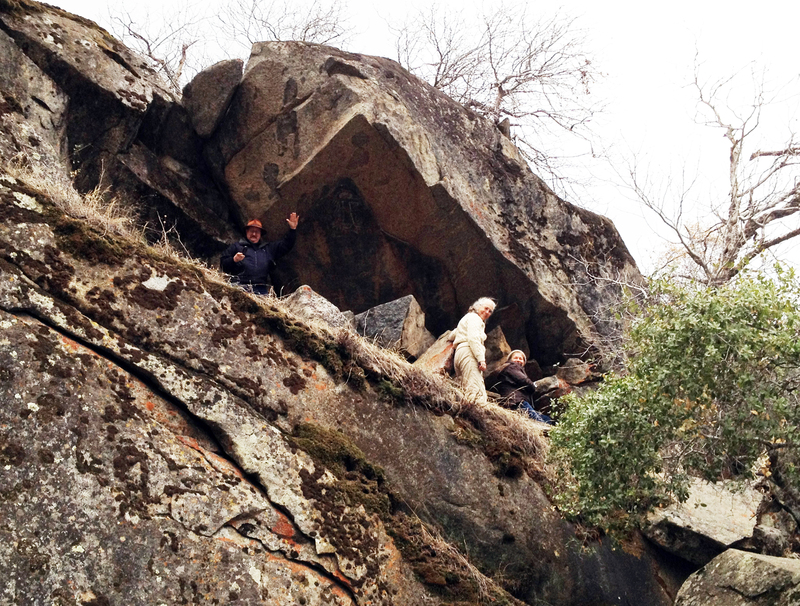 Michael Fuller (Professor of Anthropology at St. Louis Community College) inside the shallow rockshelter; scale is 30 cm. 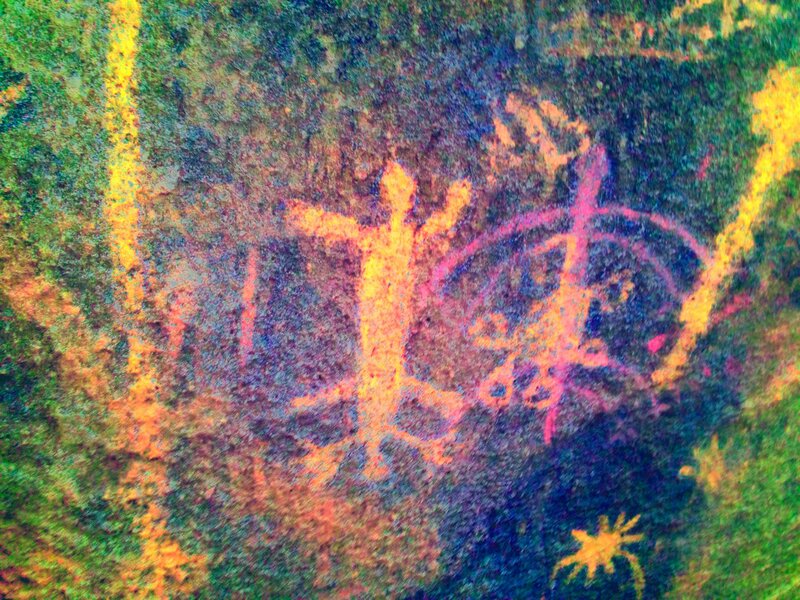 DStretch image of pictographs on the ceiling of a shallow rockshelter. 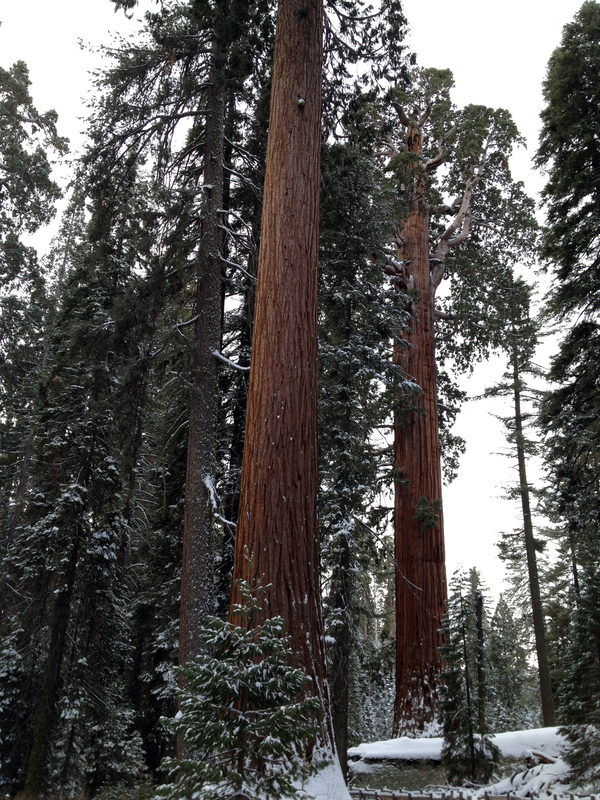 Many thanks to Professor John Pryor (CSU-Fresno), Mary Amanda Gorden (Southern Sierra Archaeological Society), Linn Gassaway (Zone Archaeologist for Giant Sequoia National Monument), and Susan Loucks for a wonderful day of rock art sites and Giant Sequoias. 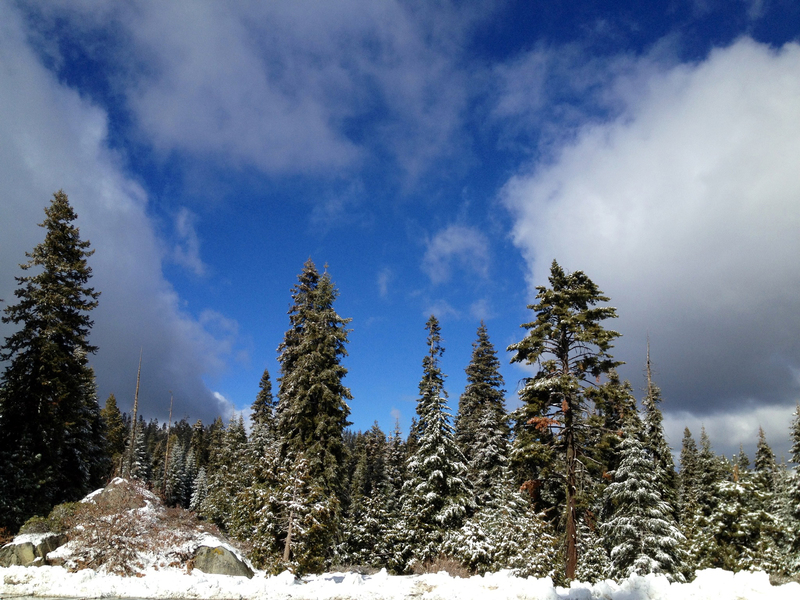 Many thanks to Jon Harman for developing the DStretch plugin. It was my great pleasure to lecture for the Fresno society of the Archaeological Institute of America.